Many of us work for bosses and with coworkers who blame people for the wrong things, for the wrong reasons, at the wrong time. 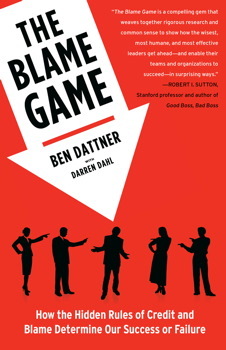 This environment is truly toxic, according to Ben Dattner, author of The Blame Game: How the Hidden Rules of Credit and Blame Determine Our Success or Failure. We see it everywhere: a CEO blaming his company’s failure or troubles on his predecessor; an employee egregiously taking credit for a co-worker’s idea or accomplishment; a government official referring to a huge unpaid tax bill as an “accountant’s error” or an oil company official pointing the finger at every organization except his own in the wake of a disastrous spill. Just look out your office door or over your cubicle wall and you’re likely to find a co-worker either trying to collect praise from you, your peers, or your boss for the invaluable contributions they’ve made or working hard to deflect blame — especially during tough times when everyone fears a single mistake could cost them their job. It wasn’t the shipping clerk’s fault that the customer didn’t receive the order; blame the delivery company. You can’t blame product development for the company’s poor quarterly results — the fault lies clearly with the sales team. Listen in on any given conversation between two colleagues out on the street or at a restaurant in which someone is complaining about his or her job, and you’ll find the discussion almost inevitably involves outrage about not getting fairly credited or resentment about getting unfairly blamed, and feeling unappreciated or persecuted. And while the tendencies to pull undue credit toward ourselves and push blame toward others are pervasive in our work lives, they are never more intense than at the worst possible time: when the stakes are high, times are tough, and trust, collaboration, and new approaches are necessary. 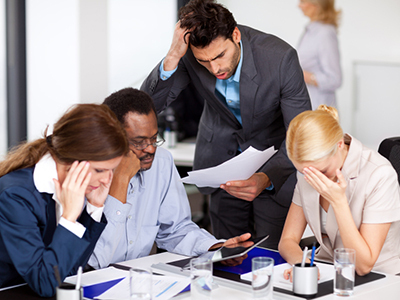 How we handle credit and blame is also contagious; it can quickly have devastating and widespread effects throughout the workplace. For example, I was once brought in by the CEO of a technology company to consult to a state-of-the-art scientific facility where world-renowned scientists and highly experienced administrators were locked in a cycle of blame. Their director had left to go work for a start-up, and the people he left behind were facing a budget shortfall as they tried to recruit a replacement. Far away from the CEO and corporate headquarters, those who worked at the facility felt neglected by management and were growing increasingly concerned that their division would be closed or sold. Rather than trying to work together and make shared sacrifices to protect their jobs, however, the scientists and administrators blamed each other for the director’s departure and the worsening financial situation. The finger-pointing became evident even to the candidates who came in to interview for the position of director. Most left the building turned off by the toxic atmosphere and the way members of each of the feuding groups talked about the other. The dynamics of credit and blame playing out in this way worsened the budget crisis and lengthened the time it took to recruit a new director, creating a self-fulfilling downward spiral which put the survival of the laboratories in more doubt than ever. As an organizational psychologist, I consult to organizations, large and small, for profit and not-for-profit, in the United States and abroad. Every time my phone rings, there is an individual, team, or organization on the line seeking assistance with issues relating to credit and blame. Whether it’s a CEO wondering why his management team has become mired in finger-pointing and isn’t getting along, or a financial analyst at a hedge fund worried she won’t get a fair bonus, there has not been a single instance in which I have advised individuals, groups, or an organization where credit and blame was not a crucial issue, if not the single most important issue underlying their problems. I’ve learned through years of consulting with major corporations as well as by serving as National Public Radio’s Morning Edition workplace consultant, that “the blame game” — the elaborate set of self-serving rules and subjective judgment calls which impact how we keep score of blame or credit for ourselves and others — is a key factor in whether workplace relationships are friendly and collaborative or harsh and unforgiving. The dynamics of credit and blame — and specifically whether we succumb to the blame game ourselves or learn to avoid its tempting allure — also have a great deal to do with how successful we will ultimately be. Within teams, credit and blame determine whether scapegoats will be identified and persecuted, or whether collective responsibility will be taken when things go wrong. Between teams, credit and blame dynamics can help explain why collaboration and trust are present, or why negative spirals of mutual recrimination are occurring. How credit and blame are assigned can even determine whether entire companies adopt a mindful view of their challenges and take necessary actions in order to move forward, or get stuck in dysfunctional finger-pointing and score-settling. Now in paperback, the acclaimed guide by a leading workplace expert that offers essential advice about how to succeed at work by avoiding the pitfalls of pervasive credit-grabbing and finger-pointing. Ben Dattner is the founder of Dattner Consulting, a workplace consulting firm that helps corporate and non-profit organizations sort through their credit and blame issues in order to enhance individual, team and organizational performance. His clients include companies ranging from small start ups to global corporations, non-profit and educational institutions, and government agencies. Dattner is also an Adjunct Professor at New York University, where he teaches Organizational Development in the Industrial and Organizational Psychology MA Program in the Graduate School of Arts and Sciences. He has also taught Strategic Career Management in the Executive MBA Program at NYU Stern Business School. Ben received a BA in Psychology from Harvard College, and an MA and Ph.D. in Industrial and Organizational Psychology from New York University. He lives in New York City and his website is www.dattnerconsulting.com.